Larry J. Sabato's Crystal Ball » Forecasting the 2016 Presidential Election: Will Time for Change Mean Time for Trump? Forecasting the 2016 Presidential Election: Will Time for Change Mean Time for Trump? Dear readers: We’re pleased this week to continue our series on the political science forecasts of the presidential election with a piece from Crystal Ball Senior Columnist Alan Abramowitz on his Time for Change model. Interestingly, the model shows Donald Trump as a small favorite in the presidential election. As you’ll read, Abramowitz throws some cold water on his own model by noting Trump’s challenges, but Abramowitz’s model is one more indication that a generic Republican very well could have been the favorite in 2016 — and that if Trump comes back to win the election, it might be because certain “fundamentals” (like the state of the economy and the president’s approval rating, which Abramowitz’s model stresses) indicated that the country was ready for a change. The rest of this week’s very full Crystal Ball shows our Electoral College map moving a little bit more in favor of Hillary Clinton and also looks at the state of play in the House. Finally, we examine the increasingly frequent comparisons between 2016 and 1964, and explain why the phenomena of Donald Trump and Barry Goldwater are very different. The Time for Change forecasting model has correctly predicted the winner of the national popular vote in every presidential election since 1988. This model is based on three predictors — the incumbent president’s approval rating at midyear (late June or early July) in the Gallup Poll, the growth rate of real GDP in the second quarter of the election year, and whether the incumbent president’s party has held the White House for one term or more than one term. Using these three predictors, it is possible to forecast the incumbent party’s share of the major party vote with a high degree of accuracy around three months before Election Day. What does the Time for Change model predict for 2016? Estimated weights of the three predictors for the 2016 presidential election are displayed in Table 1. These estimates are based on the results of an OLS regression analysis using data on the 17 presidential elections between 1948 and 2012. The estimated coefficients for all three predictors are highly statistically significant and the model has an impressive adjusted R-squared of .90. Sources: Net approval from Gallup Poll in late June/early July; Q2 GDP from the Bureau of Economic Analysis. Notes: Dependent variable is percentage of major party vote won by candidate of incumbent party; first vs. later term based on terms for incumbent party. According to these results, a one-point increase in net approval for the incumbent president is worth just over one-tenth of a percentage point in vote share for the candidate of the president’s party. Similarly, a one-point increase in annualized real GDP growth during the second quarter is worth just over half a percentage point in vote share for the candidate of the president’s party. However, even after controlling for presidential approval and real GDP growth, the results in Table 1 indicate that it is much more difficult to win a third consecutive party term in the White House than to win a second consecutive term: There is an estimated reduction in vote share of more than four percentage points after two or more terms in office. Since World War II, the incumbent party’s candidate has won the popular vote in only three of nine third or later term elections compared with seven of eight second term elections; the incumbent party’s candidate has received an average of 55.3% of the major party vote in second term elections versus an average of only 49.1% of the major party vote in third or later term elections. Given these results, it appears that candidates running for reelection after only one term in the White House enjoy a substantial advantage. In fact, in the past hundred years there has been only one election in which a party lost the White House after only one term — the 1980 election in which Jimmy Carter lost to Ronald Reagan. After two or more terms in the White House, however, it appears that this advantage disappears. Even if the incumbent president is a candidate, there is no incumbency advantage in third or later term elections. As a result, these third or later term elections tend to be highly competitive. And of course 2016 is another third term election. Based on a net approval rating for Barack Obama of +6 in the Gallup weekly tracking poll for the week of June 27-July 4, an estimated second quarter change in real GDP of 1.2% according to the Bureau of Economic Analysis, and the fact that Hillary Clinton is seeking a third consecutive Democratic term in the White House, the Time for Change Model predicts a narrow victory for Donald Trump — 51.4% of the major party vote to 48.6%. How accurate are the predictions of the Time for Change Model? 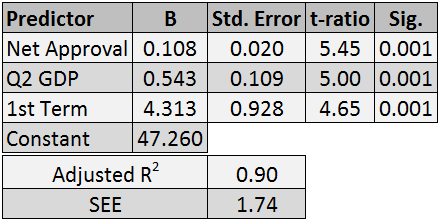 Table 2 displays the predicted vote share for the incumbent party, the actual vote share, and the error of the prediction for the 1988-2012 elections. The predictions were generated by estimating the model based on data for previous elections. That is the 1988 model was estimated based on data for 1948-1984, the 1992 model was estimated based on data for 1948-1988, etc. 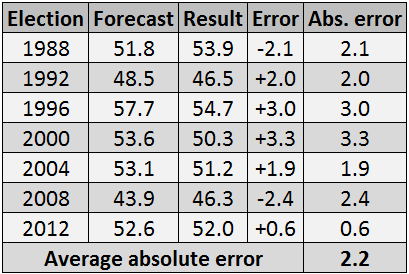 The results in Table 2 show that for these seven elections, the absolute error of the model has ranged from 0.6 percentage points in 2012 to 3.3 percentage points in 2000, with an average absolute error of 2.2 percentage points. Based on a predicted vote share of 48.6% for the incumbent party, these results indicate that Trump should be a clear but not overwhelming favorite to defeat Clinton: There should be about a 66% chance of a Republican victory. Despite the excellent track record of the Time for Change model, there are good reasons to be skeptical about the 2016 forecast. For one thing, the overwhelming majority of national polls during the spring and summer of 2016 have shown Clinton leading Trump. National polls completed shortly before and after the national party conventions gave Clinton an average lead of about five percentage points, and Clinton is up by about eight points now. Beyond the poll results, the Time for Change forecasting model is based on two crucial assumptions — first, that both major parties will nominate mainstream candidates capable of unifying their parties and, second, that the candidates will conduct equally effective campaigns so that the overall outcome will closely reflect the “fundamentals” incorporated in the model. While the assumptions of the Time for Change model are generally realistic, they will clearly hold to varying degrees in different elections. An examination of the error terms in Table 2 suggests that candidates and campaigns do sometimes have noticeable effects on the outcomes of presidential elections beyond what would be predicted based on the fundamentals. In 1988 and 2000, for example, poor campaigns very likely contributed to smaller than expected vote shares for Democratic candidates Michael Dukakis and Al Gore. And in 2008, the somewhat smaller than expected vote share for Democrat Barack Obama may have reflected the reluctance of some white voters to support the first African-American nominee of a major political party. The nomination of Trump by the Republican Party in 2016 appears to violate both of the Time for Change model’s key assumptions. Trump is clearly not a mainstream Republican and he does not appear to be running a competent campaign — he has lagged far behind Clinton in both fundraising and grassroots organizing in the swing states, and his rhetoric on the campaign trail has frequently brought sharp criticism from prominent Republicans as well as Democrats. In fact, there has never been a major party nominee like Trump — a reality TV star and wealthy businessman with no longstanding ties to the Republican Party, no political experience, and a penchant for insulting major voting groups. As a result, many prominent Republican leaders, including the last two Republican presidents, and the party’s 2012 nominee have refused to endorse Trump. In recent months, Trump has received the highest unfavorability ratings of any major party nominee in the history of the Gallup Poll. Clinton also receives high unfavorability ratings from voters; however, Trump’s ratings have generally been far worse than Clinton’s. According to the most recent Gallup data (Aug. 3-9), Trump had a net favorability rating of -31, while Clinton had a net favorability rating of -17. The question is how much the Republican Party’s nomination of Trump will move the needle away from its slight tilt toward the GOP based on the fundamentals in 2016. There is no way to answer this question until after the election. Based on the results of other recent presidential elections, however, as well as Trump’s extraordinary unpopularity, it appears very likely that the Republican vote share will fall several points below what would be expected if the GOP had nominated a mainstream candidate and that candidate had run a reasonably competent campaign. Therefore, despite the prediction of the Time for Change model, Clinton should probably be considered a strong favorite to win the 2016 presidential election as suggested by the results of recent national and state polls.